After coming in from the cold today I sat down at my desk to enjoy my first cup of hot tea in my Fine Life Ceramic Tea and Coffee Mug. 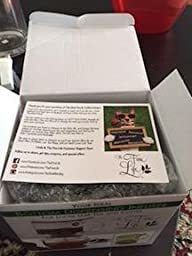 Even better: My tea was made using the Fine Life French Vanilla Tea. This mug is an attractive mug, comfortable in the hands. It has a white interior, with black exterior, and written on the side is “I’m Living the Fine Life”. Overall, it seems like a nice mug. Put together with the infuser and the tea, it makes for a nice set. I’m happy I have it and will enjoy using it. Simple to use for this first time infuser user! I love tea and don’t drink often enough. I am trying drink more along with my healthy eating. 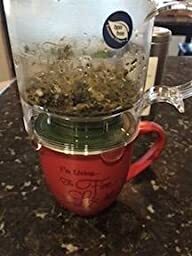 I have always brewed tea with tea bags never with an infuser. I was a little intimidated when I opened the box because I wasn’t sure what to do with this contraption! 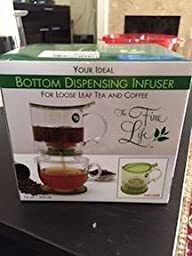 The Fine Life infuser comes with VERY clear simple instructions on how to use it. It was a breeze! 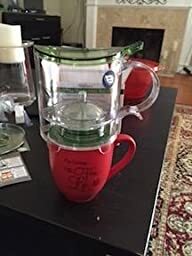 It comes with the infuser, and extra screen filter, a scoop for your tea, and an extender to fit over any size mug. What a great set. I opened the flip up top and scooped the tea inside. I then added boiling water and let it steep for about 5 minutes. The cool thing about this is its so easy to filter straight to your mug! 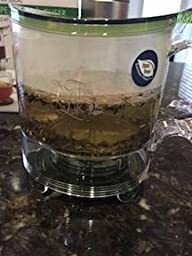 It has little feet on the bottom preventing it from leaking but when you place it on your mug it pushed up the piece, releasing the tea through the filter. SO EASY! This makes me want to start a tea collection. It was actually fun to use. http://the-fine-life.com/wp-content/uploads/2016/02/Profile-pic.jpg 0 0 Linda http://the-fine-life.com/wp-content/uploads/2016/02/Profile-pic.jpg Linda2016-01-12 15:55:572016-03-04 15:57:51Simple to use for this first time infuser user! Mister works quite well once well pressured. After a few tries, realized that it is under-pressured when it starts to throw out droplets rather than misting. Per instructions, have tried to store without pressure, but that means not having a tightened seal – may be a design detail for the next generation to be solved (a relief mechanism after storing the pump top). I like this sprayer because you can see how much oil is in the container, also the instructions for cleaning it with lemon or vinegar. The spray works very well, it is very fine but provides good coverage. I am very happy with this mister! http://the-fine-life.com/wp-content/uploads/2016/02/Profile-pic.jpg 0 0 Linda http://the-fine-life.com/wp-content/uploads/2016/02/Profile-pic.jpg Linda2015-02-28 23:47:592015-03-06 23:50:24I am very happy with this mister! Gave to friends for Christmas! http://the-fine-life.com/wp-content/uploads/2016/02/Profile-pic.jpg 0 0 Linda http://the-fine-life.com/wp-content/uploads/2016/02/Profile-pic.jpg Linda2014-12-30 00:53:162015-02-20 00:54:15Gave to friends for Christmas!